Faoi dheireadh thiar thall tá an obair Ealaíne á crochadh ar fallaí na scoile! Magnificent work done today by Michael and his team! Míle buíochas leis an meitheal oibre a tháinig i gcabhair orainn inniu; Jenny, Roseanne, Amy, Ben, John, Aileen, Mary-Anne, Kimberley,Shannon, Frances, Orla, Denis agus Amy…. Under Michael’s guidance we honed our skills and by the end of the morning we were qualified grouters…. We look forward to receiving our certificates in the post Michael! The firing on the tiles has slowed down. We are using the kilns in the sculpture factory in Cork, we’re finding that the heat in the kiln is not even so the tiles loaded at the top are over heating and the bottom tiles are so cool that the glaze hasn’t melted fully. Therefore we have had to put the last glazed firing in again. Today we will see how they are. We have decided to give the first firing (bisque fire) to all the tiles in the sculpture factory. This makes them a lot stronger and the uneven heat is not such a problem. They will all be bisque fired by the end of next week. Then we will take them all to our studio in Co. Wicklow where we have a kiln. 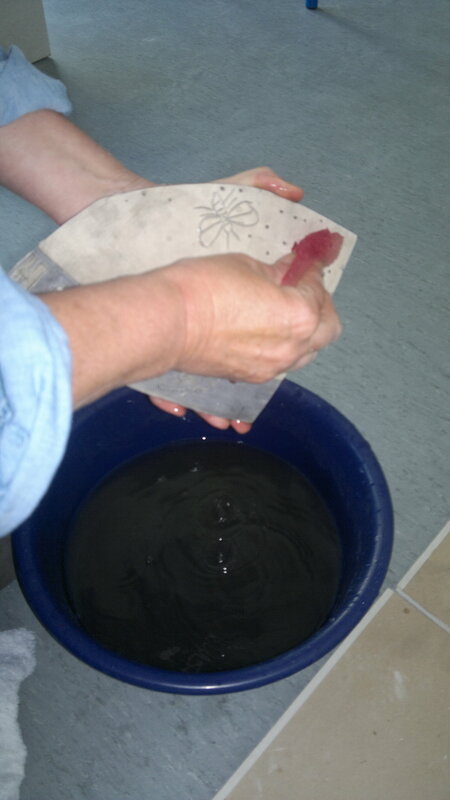 In Wicklow we will continue with the underglaze colouring and firing.When all the work is finished we will be coming back to Cork to install in the school during the last week in August. It will all be up and ready by the time schools opens on 29th August. If there are any parents out there willing to help with grouting the tiles around the 23rd August we would love to have you. Please ring or text Liz 0868880602. Glazing the St. Gobnait panel. Today we have help glazing the panels. The artist Yanny Petters, one one Irelands top botanical artists, has come to help. 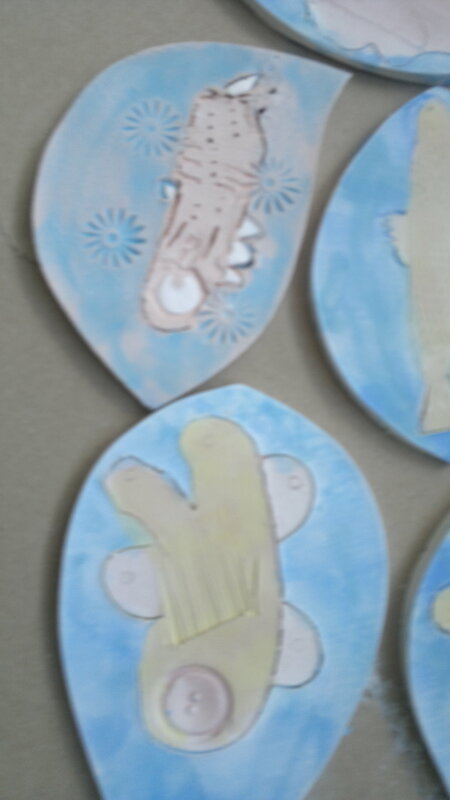 She is very impressed by the quality of the children’s work. 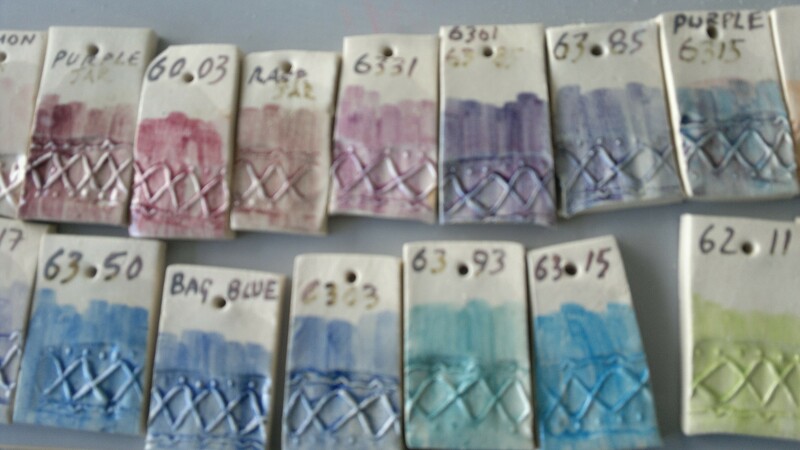 Colour samples for the clay. Bhí an spórt ag gach éinne ag baint triail as an adharc chré-umha! Everyone got a chance to handle the bronze axe-heads, bellows, cuttlefish pieces and other artefacts that were on display. Seans gur chualadar fuaimeanna iontacha na h-adhairce trasna an ghleanna uainn i mBaile Nóra! And great fun was had trying to get a sound out of the beautiful replica of the Bronze-age horn that Fiona has made, with the trumpet, clarinet and flute players coming out on top! Having had the initial firing in the oven, the first layer of paint is applied to the tiles. The colour will be built up layer by layer like a watercolour picture. 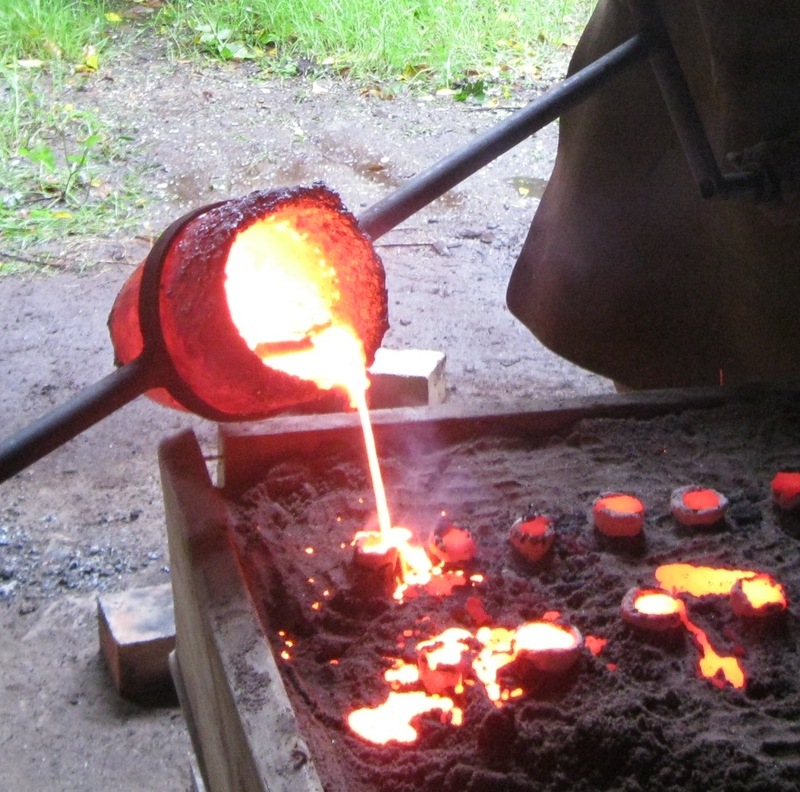 It is not a surprise that metal workers would be revered.Working with metal and fire where the solid becomes like a fluid sun would be magical. When “a committee of the leading men of Ballyvourney” raised the funds in 1950 to commission a statue of St. Gobnait near the traditional site of her sixth-century convent, their work was interrupted after significant archaeological objects were discovered during the site preparation. The small circular early medieval enclosure called St. Gobnait’s House was found to sit upon the remains of some 137 forges, perhaps dating to as early as the first few centuries. Thus long before St. Gobnait’s time at Ballyvourney, the landscape would have been filled with the smoke and the din of an early industrial site where objects of iron and bronze were manufactured. Gobnait and her convent continued the practice of working with metals. Gobnait was the patron saint of iron and bronze workers. The pet name of Gobnait –Gobba come from Gabha which means smith. Goibniu was the Celtic God of fire and metalwork. It could be that Gobnait got her name from this God .